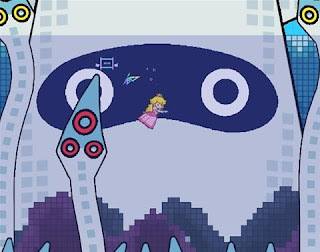 According to one of my favorite gaming sites (GoNintendo), a recent podcast from the folks at another great site (1up) features new information about the game I'm most looking forward to in the next few months: Super Paper Mario. The game begins like the rest of the series (i.e., in a town with an inn, shop, roaming characters...). Stages are numbered just like old-school Mario games. You cannot run or throw turtle shells at the beginning of the game. Apparently you learn these moves as you advance through the story. Classic characters appear, some in "remixed" form. The game opens with video footage. Hmmm, not sure what to think about some of that. The combination of RPG and platforming elements sounds a bit bizarre. I'm going to give Intelligent Systems the benefit of the doubt, though, since the previous Paper Mario games turned out so beautifully.